Free Shipping Included! 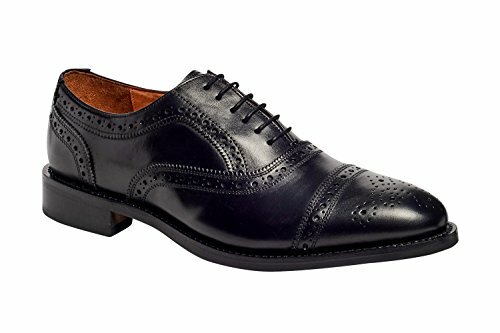 Anthony Veer Mens Ford Oxford Semi Brogue Leather Shoes In Goodyear Welted Construction (11.5 D, Black) by Anthony Veer at SCRHI. MPN: 12345465646. Hurry! Limited time offer. Offer valid only while supplies last. Anthony Veer's Ford Oxford Semi-Brogue are made in Goodyear Welted Construction, which is the finest quality of construction in shoes, industry wide! Anthony Veer's Ford Oxford Semi-Brogue are made in Goodyear Welted Construction, which is the finest quality of construction in shoes, industry wide! This welting process makes the shoe highly durable, water resistant, and comfortable as the leather molds to the foot over time. This sophisticated shoe is made with full-grain calfskin leather that portrays exquisite quality and finish. These are great everyday shoes that would make you stand out in any attire. HANDCRAFTED: Full grain-calfskin upper leather and Leather Lined Cushioned Insole. If you have any questions about this product by Anthony Veer, contact us by completing and submitting the form below. If you are looking for a specif part number, please include it with your message.